These new-school methods help home cooks evolve almost as quickly as tastes do. We’ve seen great tides of change overtake the food world in the past few years, from reservation tech advances like Resy, to received policy changes rewarding line cooks. So it was only a matter of time before the recipe—the fundamental building block of cooking—received its own make-over. The formula for delivering recipes has remained relatively straightforward through the years: a simple list of ingredients, with instructions on how to assemble them. But in the information age, recipes are experiencing a fundamental shift, especially as our technological toolkit continues to expand. Those ripped-out magazine pages and handwritten notes are now competing with sophisticated instructional platforms that are much more dynamic than a mere sheet of paper. The core concept behind this new generation of recipe writing is best expressed by Alton Brown and his take on the “living recipe.” In an interview with Serious Eats back in 2012, he talked about the possibilities of a set of instructions that never stays static, constantly evolving through user feedback accrued by various social-media channels (think of it as a social-media test kitchen army). Food52, which began by submitting home-cook recipes to the rigors of a professional test kitchen, is a great example of this idea in action. Brown even went so far as to postulate a “choose-your-own” Goosebumps-style recipe path based on personal preferences. We know recipes themselves morph over time, often based on things like shifting health attitudes (e.g., coconut oil instead of butter) and upgraded ingredients. But now the door is opening for a much more complex, interactive experience. From 140 character snippets to wordless infographics, here are four new ways the recipe is evolving. 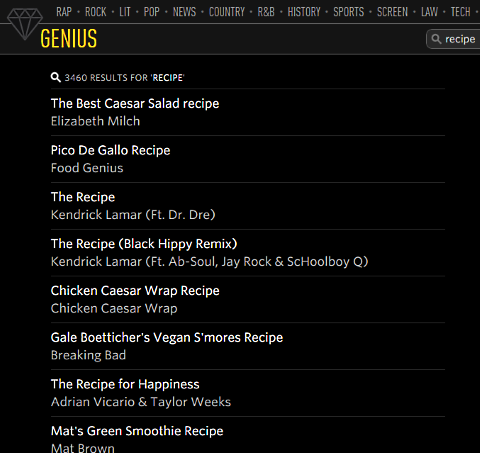 What started off as Rap Genius has broadened into something much more than the premiere destination for annotating rap lyrics. Currently, Genius lets you find everything from Jane Austen annotations, to Caesar salad recipes, to lyrics for Kendrick Lamar’s “The Recipe.” The cooking section—created with the help of Food52—is a perfect example of Brown’s “living recipe” theory. You can follow a recipe straight through, or you can read other people’s notes for additional insight. If you disagree, you can always tweak and add your own notes. The power behind this crowd-sourced idea is simple: not only is it showing you an alternative, but it’s telling you why it works. Look closely. These are awesome acts of compression. Ingredients, actions, quantities, times and temperatures — both Fahrenheit and Celsius — boiled down to utmost richness, density and clarity. A dish, a meal, a trip to deliciousness magically packed into the tiniest carry-on bag. Twecipes rely on tons of abbreviations to get the job done, but the Guardian offers a helpful glossary of abbreviations, and there’s an exhaustive @cookbook-specific abbreviations wiki available too. I tried a bunch of them the other day. I set a rule for myself: the tweet was sacred text; no world existed beyond it. All I knew I would have to discern from the tweet. To make it harder, I picked two international recipes whose names I did not recognize. They conjured no associations; results would be a surprise. Downes was surprised and delighted at how well the results came out, but cautioned that Evans sets the twecipe bar pretty high. It’s certainly a form that works best for people who like both challenge and risk in their cooking exploits. What’s the next step after slimming down bloated recipes to Twitter size? Getting rid of words altogether. That’s where Cookograph comes in. Cookograph creator Michael Todd thinks that visual recipes are the way of the future for people who don’t have time for alphabet soup. 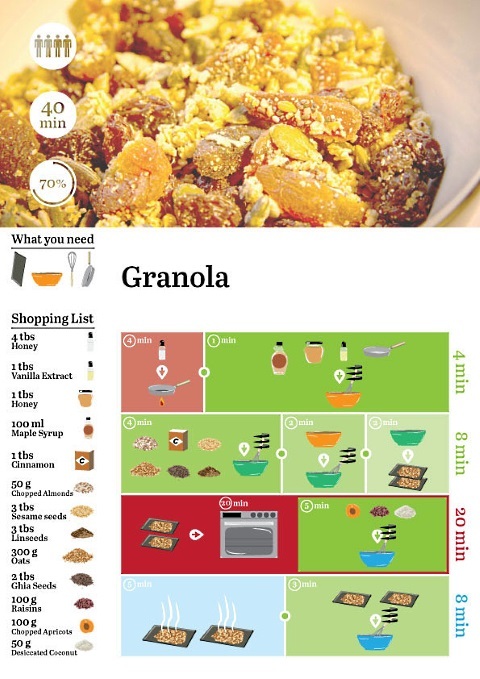 With the popularity of how-to infographics explaining proper useage of aromatics, or guiding people through local food specialties around the world, it’s easy to see why he thinks this idea has staying power. Time will tell if Todd’s belief resonates with other home cooks who don’t have the confidence or patience to tackle a traditional recipe. Check out the video for Todd’s Kickstarter, which is currently seeking funding to make Cookographs a reality right now. Youmiam is a recipe-sharing social network that combines the sharable qualities of Soundcloud and the visual appeal of Pinterest to make the recipe slideshows of your dreams. Each step shows you an ingredient and tells you how to proceed with said ingredient. It began as a French-only project but is now branching out into English, thanks to some generous angel investors. 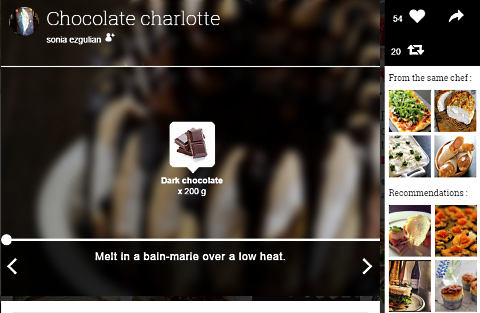 You can ‘heart’ recipes, follow chefs you like, and share things you find on Youmiam across other social platforms. Text is limited, so everything remains blissfully clear and uncluttered; searching by keywords is also a snap. It’s a happy medium between text overload and reverting to childish picture books. 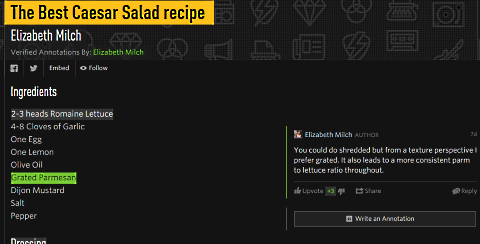 And, for what it’s worth, we’re trying to our own part to contribute to the recipe revolution by adding MORE GIFS!